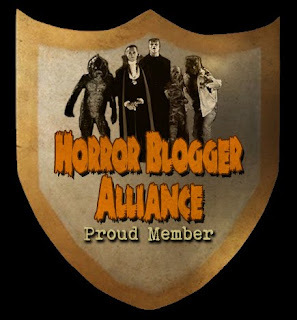 Synopsis: Times are hard in the village of Frankenstein, and a town hall meeting is being held to discuss the situation. The village’s reputation has suffered greatly since the events of Son of Frankenstein (1939) and now the inn stands empty, the children go hungry, and a general atmosphere of despair hangs over the town. What can be done to make life better for the citizens? Well, not much, the mayor admits. But he allows the villagers to go blow up the abandoned castle of the Frankensteins, which they believe is still carrying the family curse. Of course it can’t be a real Frankenstein movie without a torch-wielding mob, and this one races off to carry out its mission. Meanwhile, we find that Ygor (Bela Lugosi) has remained in the old castle, playing a rustic horn (which sounds suspiciously like an oboe) by the sulfur pit where his friend the monster was destroyed in the previous film. When the villagers trigger the explosives and blow apart the castle, the monster is freed, and Ygor is delighted to find that he is still alive, though greatly weakened. The two of them flee the destroyed castle. They make their way to the nearby village of Vasaria. 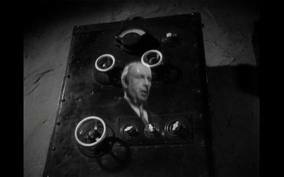 But the monster is soon captured by the police and imprisoned, and the village prosecutor, (Ralph Bellamy) goes to the local psychiatrist, Dr. Ludwig Frankenstein (Sir Cedric Hardwicke) and asks him to come and assess this difficult case. But before Frankenstein can do so, Ygor pays him a visit as well. He tells Ludwig that he knows something the people of Vasaria don’t know — that he’s the brother of the hated Wolf Frankenstein and the son of the even-more-hated Henry Frankenstein. Moreover, Ygor threatens to reveal this information to the locals if he doesn’t act to help the monster. Compelled to hide the monster in his laboratory, Ludwig decides that it must be destroyed once and for all. He prepares to drain all of the electricity out of the monster’s body and disassemble it piece by piece, essentially reversing Henry’s installation instructions. But he is visited by the ghost of his father, who implores him to carry on his work and recharge the monster to full power…. Comments: In writing previously about Frankenstein Meets the Wolf Man, I speculated that Elsa Frankenstein must have been the daughter of Ludwig Frankenstein, because (a) Wolf is exile and (b) she came from Vasaria, just as Ludwig did. Seeing Ghost of Frankenstein again, I realize that Elsa was under my nose the entire time. In fact, she plays a prominent role in this film — she is clearly identified as Ludwig’s daughter. How could I have forgotten her? The answer is simple, really. I’d forgotten her because she is played by Evelyn Ankers, who never leaves any impression on me whatsoever, either good or bad. Ankers possesses a sort of generic prettiness, but her looks aren’t remarkable in any way. She is a reasonably good actress, but lacks a definitive style. She has just enough screen presence to be cast as the female lead in Universal horror films, but not quite enough to prevent her from fading into the background whenever the camera is pointed in her direction. Compare her to Ilona Massey, who played Elsa in Frankenstein Meets the Wolf Man, and Anker’s shortcomings become clear. Massey is in every way a striking presence: she projects an aloof and aristocratic manner that barely masks her guilt and anguish over her family’s checkered history. Her Elsa is sharp-eyed and intelligent, someone who sees what is coming and cannot quite prevent it from overtaking her. While these attributes aren’t written into the script, they are evident in Massey’s face and delivery; these are the hints toward an interior life that good actors are able to communicate. Ankers is simply incapable of a performance of that caliber, and so her Elsa is entirely forgettable. But Elsa’s character doesn’t have a lot to do here, so perhaps it’s unfair to blame Ankers. This movie ultimately belongs to Sir Cedric Hardwicke, who plays Ludwig, and Bela Lugosi as Ygor. The two actors are at the absolute top of their game, and particularly riveting in their early scenes together. Ludwig has made a life for himself beyond the shadow of the Frankenstein clan, but now he is suddenly confronted by a man who can take all that away. For his part, Ygor knows how much Ludwig enjoys the status and the prestige of his current position; furthermore, he knows that Ludwig’s family knows nothing of his father’s crimes. Ludwig is a man with everything to lose, and therefore a tempting target for extortion. Had money been Ygor’s motive, things would have ended much more happily. 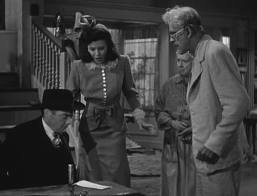 Ralph Bellamy appears as Vasaria’s prosecutor as well as Elsa’s love interest. He’s strangely unengaging here, much as he was in The Wolf Man. But he’s a great pro, and it’s lovely to see an actor in this sort of role who isn’t Patric Knowles. Synopsis: Nathanial Billings (Boris Karloff) is a wigged-out professor who owns a dilapidated colonial inn. Billings carries out unorthodox experiments in the basement of the house, much to the consternation of the town mayor / sheriff / banker / justice of the peace Dr. Lorencz (Peter Lorre). Billings is paying a usurious interest rate on the mortgage and for this reason is eager to sell. The only hitch is that nobody would want the place — it is in desperate need of maintenance and is quite off the beaten track. Remote inns are especially unpopular destinations these days, due to wartime rationing of tires and gasoline. The nature of his experiments quickly becomes clear to us. Billings is a patriotic fellow, and he wants to do his part for the war effort. He believes he is closing in on a method of making ordinary men into super-soldiers. Alas, none of the door-to-door salesmen he’s used as guinea pigs have become super-soldiers. In fact, none of them have survived the treatment. So there is a growing stack of dead salesmen in the basement, which he is desperately trying to hide. Soon Winnie’s ex-husband (Larry Parks) shows up and immediately becomes suspicious of the goings-on around the house, Dr. Lorencz becomes an unlikely backer in Dr. Billing’s experiments, and a new dopey door-to-door salesman ( “Slapsie” Maxie Rosenbloom) becomes the latest chump hoping to be converted to a superman. Comments: I wasn’t looking forward to seeing this Boris Karloff – Peter Lorre madcap comedy a second time, but I did it just the same. And I did it for you, gentle reader. Was it painful? Yes, it was. Thanks for asking. You mustn’t feel too sorry for me, though, because The Boogie Man Will Get You does have its moments. For instance, Miss Jeff Donnell was quite engaging as Winnie Slade. Donnell was never regarded as leading lady material — while she would be considered reasonably attractive here on Earth, in the alternate universe of Hollywood movies she is unacceptably homely. She played a prominent role in the excellent Humphrey Bogart vehicle In a Lonely Place; and she gives this distinctly minor comedy her all as well. Peter Lorre and Boris Karloff both seem to be having a great time, and I must admit that it is fun to watch them sending up their own favored genre. Lorre in particular has deft comic timing and his little bits of stage business — like casually placing a kitten into his inside pocket of his coat — are a lot of fun. Since my last viewing I’d entirely forgotten the presence of Frank Puglia, who shows up late as Silvio Baciagalupi, a wacky Italian soldier who escapes from a POW camp and is running around the New England countryside threatening to blow things up. In spite of 10 – 15 minutes of screen time, Puglia doesn’t even appear in the credits (which seems quite strange today, given that every grip, hairdresser and caterer is now credited). Puglia kept busy during the war, appearing in nine movies in 1942 and another 10 in 1943. He often played “ethnic” roles (usually Italians and Latinos) and appeared as Dr. Leonardo in the fondly-remembered Ray Harryhausen opus 20 Million Miles to Earth (1957). He made a smooth transition into television, doing guest shots on countless drama programs throughout the 1960s. Larry Parks is an amiable presence in this film, and seems well-suited to screwball comedy; but what he had really hoped for was a career as a dramatic lead. He enjoyed some recognition for playing Al Jolson in The Jolson Story (1946) but in 1951 he ended up on the Hollywood blacklist. His movie career ruined, he carried on gamely with stage work and a night club act, hoping that the controversy would eventually blow over and that he’d be able to resume working in Hollywood. That never happened. But it’s difficult to say if his career would have ever taken off, with or without the blacklist. The Boogie Man Will Get You appears to be his only genre film. 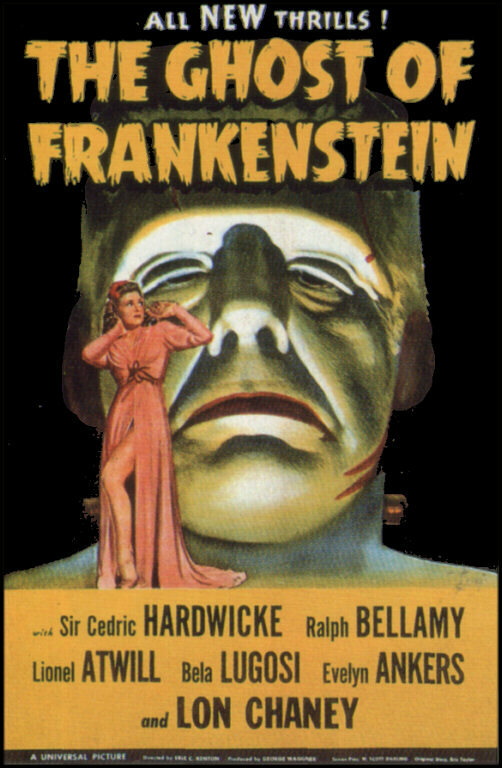 “The Ghost of Frankenstein” was the fourth film in Universal Frankenstein series. Although the budget and the operating time is reduced, is still an entertaining movie. 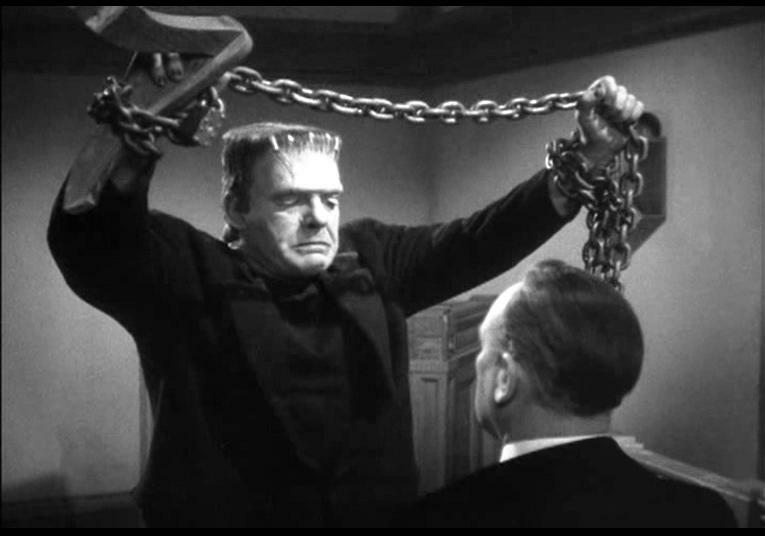 I always liked Lon Chaney's Monster in THE GHOST OF FRANKENSTEIN, although it's clearly less defined than Karloff's, while Lugosi's Ygor again steals the show. The ending certainly made further sequels problematic (is The Monster now supposed to be Ygor? ), but the fiery climax, quite gruesome for its time, did reappear in HOUSE OF DRACULA. Plus, pairing Bela with Lionel Atwill always made for solid entertainment. 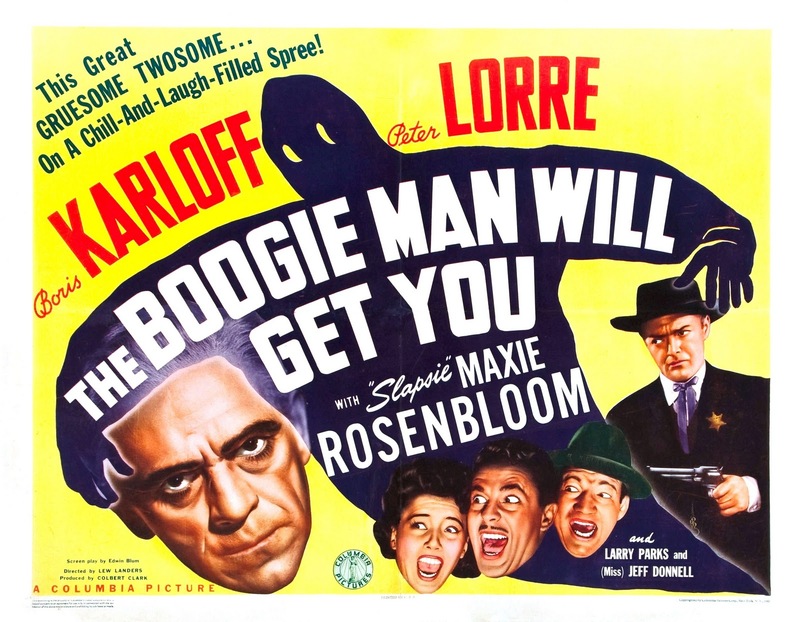 Karloff and Lorre first met on the set of CHARLIE CHAN AT THE OPERA, and were teamed at least 5 times over the next 27 years (this film, YOU'LL FIND OUT, THE RAVEN, THE COMEDY OF TERRORS, and the “Lizard's Leg and Owlet's Wing” episode of TV's ROUTE 66). They provide virtually what little life this title has, an obvious ripoff of Karloff's concurrent Broadway success in ARSENIC AND OLD LACE. I agree that 'Miss Jeff Donnell' was an attractive, underrated presence at Columbia, seen in the WHISTLER, I LOVE A MYSTERY, and BOSTON BLACKIE series, as ubiquitous as Nina Foch. I last saw her on KOLCHAK:THE NIGHT STALKER (“The Knightly Murders”), selling Kolchak a coat of arms based on his Polish heritage (the lion of Warsaw? ).